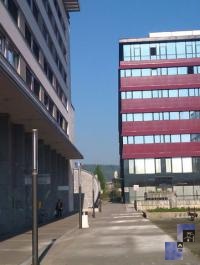 The studio is located in the city center of Ljubljana on Metelkova Street – less than 10 minute walk from the open air market hall, famous St Nicholas Cathedral and Dragon Bridge in a new quiet neighborhood, close to the main bus and railway station and in the vicinity of the Medical center. 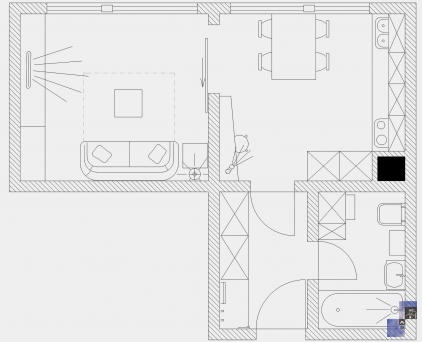 This modern remodelled studio is located on the fourth floor with an elevator access. The high-quality kitchen is equipped with built-in Miele appliances: large refrigerator/freezer, dishwasher, stove/microwave, steel/ceramic induction oven. The kitchen also includes a dining corner with a dining table for 4 and a multipurpose bar which can serve as a work station. The living area of the studio includes a comfortable and functional loveseat which easily extends into a 140 x 200 cm bed. The floor is oiled parquet. The bathroom includes a bath with a glass shower and a Miele washing machine. The studio is equipped with CATV with an LCD television, free broadband wired and wireless (Wi-Fi) internet access, iron and ironing board, hair dryer, sheets and towels. The garage offers daily, weekly or monthly hire of a parking space.